While searching for something else in my trove of burned CDs (and wondering why I have so many!) 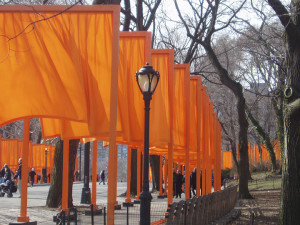 I came across one labeled Christo – Gates. It had been ages since I looked at the photos that my family and I took as we traversed the Central Park (NYC) pathways lined with this installation. So I popped it into the drive and was stunned to realize that these shots had been taken in 2005, more than ten years ago. Seeing these photos brought back two distinct memories. 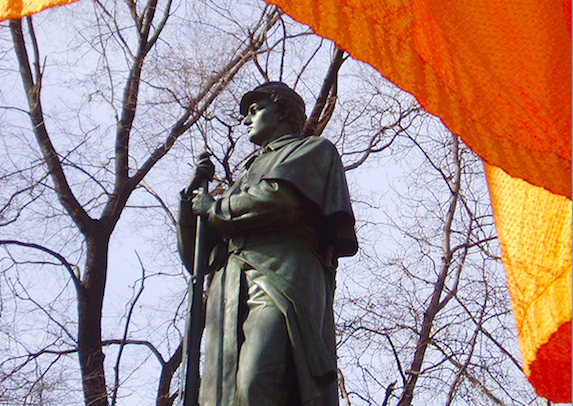 One was of the day itself — easily one of the coldest of that winter — and my family’s shared experience of wonder as we walked the serpentine paths of saffron banners that shifted with the breeze. Despite the brutal chill, the park was packed with visitors and a sense of joy was palpable. The other memory was of discussions about the project that took place in my graduate school seminar class (obviously, I was an “older” student as the mother of two young teens). The general consensus was that Gates was to be looked down upon as lightweight and somewhat frivolous. In the grad program I was in, there was the usual, borderline clichéd devotion to Marcel Duchamp, which I shared, and an odd obsession with Joseph Beuys, whose own obsessions I found revolting. I had fixed upon Sophie Calle as my conceptual heroine, but even so, I couldn’t share my professors’ and classmates’ disdain for the Gates installation. The question endlessly rehashed was whether a project with such mass appeal, and that made viewers so happy, could be considered Art with a capital A. Oddly, many of those whose answer was “no” made that determination without experiencing the installation for themselves. 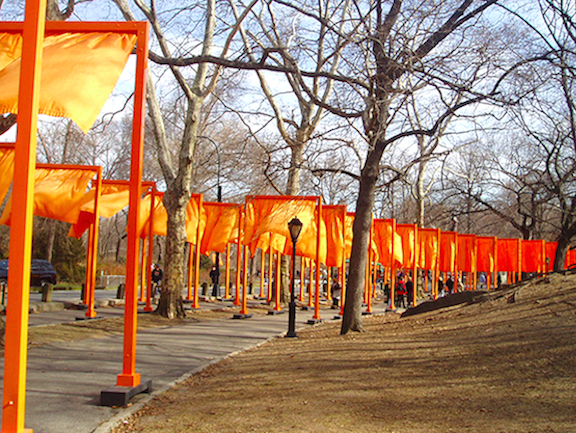 Consisting of 7,500 specially made and dyed fabric panels hanging from fabricated poles, these structures lined the walkways of Central Park. The pattern made by the Gates were distinctly visible from distances at a time when trees were barren. Many hundreds of people were employed in the construction and installation of the project, which was completely financed by the artists. It remained in the park for 16 days, left no permanent marks in the ground or elsewhere, and upon its removal, the materials were recycled. An estimated 4 million people visited the installation. More details about the fabrication and installation are here. 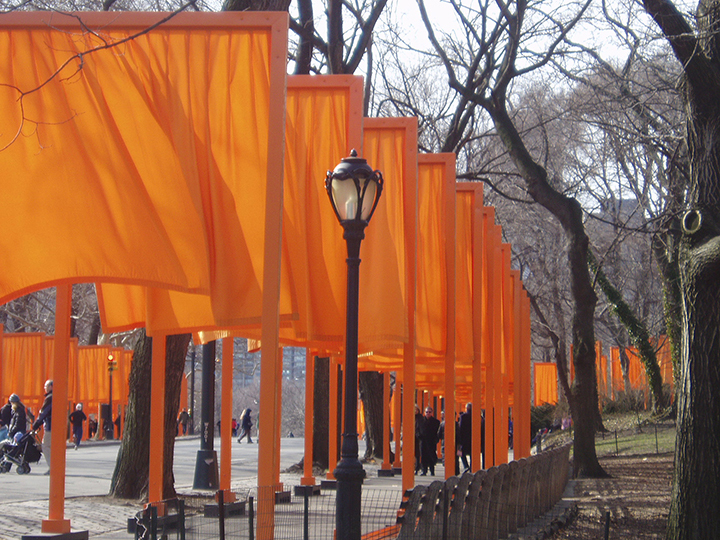 Wherever one stood on the question of Gates qualification as high art, no one could deny that, like other Christo and Jeanne-Claude projects, it was a monumental feat of engineering. And like most of their projects, this one courted controversy and mixed reactions. 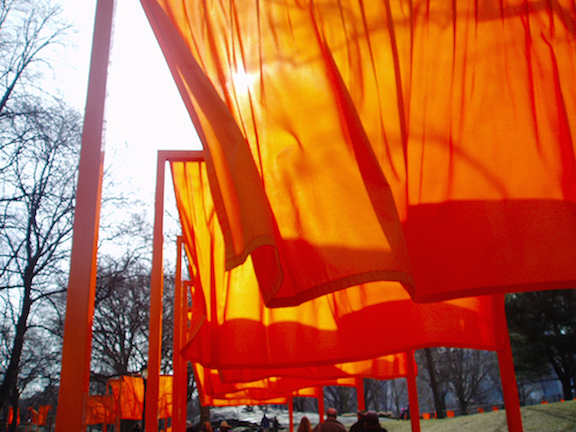 Walking though Gates was the closest I’ve ever come to a Christo installation before or since. No matter what kind of Art upon which you choose to bestow the capital A, countless people who might never have sought out any art at all were touched by walking through Gates. Perhaps some found the experience transformative. And how can that be anything but positive?